For information on the WAVESCAN technology visit www.personalbestvision.com. Anyone 21 years of age or older who is nearsighted and/or astigmatic may be a candidate for the CustomeVueTM procedure. A physician will assess if an individual is a candidate for the CustomVueTM procedure. Visit www.personalbestvision.com and talk to your doctor to find out more about VISX CustomVueTM laser vision correction. Medically, to be a candidate for Laser Vision Correction you need a stable glasses prescription. The most important requirement is that your vision can be corrected to normal with glasses or contacts. If your vision is inadequate even when you wear your glasses, then this surgery will not solve your visual problems. A comprehensive eye examination is done to determine if you are a candidate. Glasses and contact lenses can inhibit your lifestyle for multiple reasons and Laser Vision Correction can permanently correct your vision to free you of those limitations. Some people choose occupations which have certain visual requirements, such as firefighters, state patrol officers or pilots, and have Laser Vision Correction performed to meet those visual requirements. Others have Laser Vision Correction done because of the high cost of glasses and contact lenses. And still others have it performed because they cannot tolerate contacts or glasses. Laser Vision Correction is an in-office surgical procedure. There is no pain during the procedure and you will be given a mild analgesic for any discomfort experienced after the procedure. The cornea heals quickly, usually in one or two days, so there is either minimal or no loss of work. As with any type of surgery, side effects are possible, but long-term or serious side effects are extremely rare with Laser Vision Correction. For complete information on all aspects of Laser Vision Correction, or to make an appointment for your comprehensive examination, call (330) 759-7672. The normal eye works on the same principle as a camera. The light rays or images come through the cornea, which is the clear curved membrane that covers the front of the eye. The light rays then pass through the lens, which is behind the pupil, and are then focused onto the retina. The retina, which is in the back of the eye, acts as the film of the camera and produces the image. The image is then transmitted to the brain to be developed and the picture is then "seen." If the light rays are not focused on the retina, then you are known to have a refractive error. MYOPIA, or nearsightedness, is when the eye is too long and the cornea is too deep, causing the light rays to be focused somewhere in front of the retina. This causes blurred vision for distant objects. The degree of nearsightedness determines at what distance your vision is blurred. HYPEROPIA, or farsightedness, is when the eye is too short and the cornea is too flat. This causes light rays to be focused somewhere behind the retina. Farsightedness causes blurred vision with near and distant objects. ASTIGMATISM is an irregular cornea, similar to a football, which causes multiple focal points on, before, and behind the retina. Astigmatism causes blurred vision with near and distant objects, and can occur alone or with nearsightedness or farsightedness. PRK, short for photo refractive keratectomy, is a procedure which utilizes the excimer laser to reshape your cornea. This procedure can correct nearsightedness or farsightedness, as well as astigmatism associated with nearsightedness. To correct nearsightedness, the excimer laser beam is directed on the central surface of the cornea. The pulses of ultraviolet light remove microscopic layers of the cornea. This flattens the cornea so the light rays are focused on the retina. 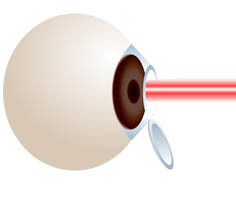 To correct farsightedness, the excimer laser beam is directed on the peripheral surface of the cornea. The pulses of ultraviolet light remove microscopic layers of the cornea and reshapes the cornea to compensate for too little curvature. Prior to the procedure, your eye is numbed with drops so you are comfortable. During the procedure you will lie flat on a chair and will be awake. Your eyelids are held open with a special instrument and you will be asked to look at a small light. The laser treatment usually takes less than one minute. As with any surgical procedure, risks are involved. Prior to PRK, risks and side effects will be explained in detail and you will be asked to sign a consent form. Infection, although rare, could scar your cornea and decrease your vision. Irregular astigmatism, over correction or under correction are possible. Some people become more sensitive to glare or see halos around lights. A haze may develop in the cornea and vision may remain cloudy for a period of time. For complete information on the PRK procedure, call (330) 759-7672, for your comprehensive examination and consultation. Go home and sleep or rest. Mild pain medication is sometimes needed. Your operative eye may feel irritated and tear up to a few days. If you had PRK your vision may be blurred for a few weeks up to a couple of months. As your eye heals, you vision will become clear. Patients who had LASIK however, recover vision much faster. For a few weeks you may experience fluctuation. One day your vision may be better than the next, or your morning vision may be better than your night vision. Your eye may continue to be sensitive to touch for the first two weeks. The eye drops may sting when you apply them, and the drops may temporarily blur your vision. If your eye becomes reddened and irritated after the drops, please call the office. If your eye feels dry, you may use preservative free lubricating drops (tears) for relief. You may have light sensitivity after your surgery. Light sensitivity may last only a few days to up to a few weeks. Sunglasses can be worn for this temporary side effect. It is important that you come in for follow-up visits. Different eye drops may be prescribed during the healing period. Your eye may rarely need a touch-up enhancement surgery. Laser Vision Correction is surgery, which utilizes the excimer laser beam to change the curvature of the cornea thus correcting certain amounts of near sightedness, farsightedness, and astigmatism. Nearsightedness (myopia) is when the curvature of the cornea is too steep, the focus of the rays of light that enter the eye fall short of the retina. The result is a blurry view of distant objects. Astigmatism can exist alone or in combination with nearsightedness or farsightedness. With this condition you eye becomes oval-shaped like a football instead of round, causing distortion when the eye tries to focus. Farsightedness (hyperopia) occurs when an eye is too short for the cornea's curvature. Light rays entering the eye focus behind the retina, and as a result a blurred image is produced. Some insurance companies cover part or all of the procedures. Most of them however do not. You need to check with your individual insurance company. 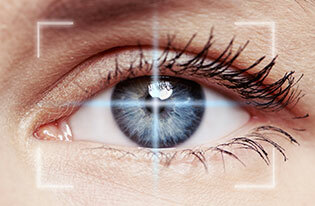 The actual procedure of Laser Vision Correction does not hurt. Some patients do experience minor discomfort during the first 24-48 hours after the procedure. As with any treatment or operation there are risks, even though they are rare. The risks and benefits will be thoroughly explained to you by a professional staff member during your screening appointment. You can have the procedure and be back to your normal day-to-day activities very quickly. Most people return to work within two days depending on your job description. During the screening appointment we will discuss this with you so that you know your options. Laser Vision Correction is being performed around the world. Over 95% of patients who have had the procedure obtain normal vision and are extremely happy to lessen their dependence on glasses or contact lenses.